Femto 4Hall RJ45 D6 is an Energy Analyzer & Data Manager for the measurement of electrical parameters in direct current DC and logging of energy. 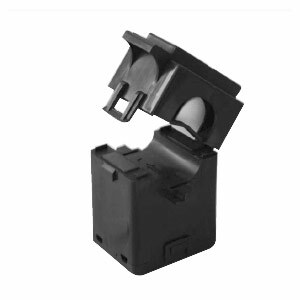 It is equipped with an RJ45 port for connecting to Ethernet networks and and ExpBus port for high speed communication with expansion Modules. Can be transformed, activation via Upgrade (PUK) option, in a net version (becoming Web Data Manager) serving as a bridge and data-logger also for other Electrex devices connected behind it in Rs485. The net version is also a FTP and Web Server, including the Upgrade Web option, displaying on a web page measurements available on the instruments’ display. The Femto 4Hall D6 uses exclusively the split current transformers Electrex CTS DC HALL (4 current inputs for up to 4 Hall effect transformers). The Femto 4Hall D6 includes the NFC technology that opens the possibility for the creation of specific APPs for mobile devices regarding energy management. Suitable for applications in renewable energy generation, storage, telecom, data-centers, and other DC systems. The panels of the Libra product family represent a “Plug & Play” solution with built-in advanced technology for the monitoring and management of electrical loads, energy production from renewable sources, other utilities (such as electricity, water, compressed air, natural gas, steam) and environmental parameters. internal window diameter 16 mm, dimensions width 30mm, height 54mm, depth 31mm. • CTS DC Hall 24-200 Code PFC0380: nominal current 200A, internal window diameter 24 mm, dimensions width 45mm, height 76mm, depth 36mm. • CTS DC Hall 35-500 Code PFC0390: nominal current 500A, internal window diameter 35 mm, dimensions width 60mm, height 80mm, depth 40mm. The Femto 4Hall D6 is equipped with a 10/100 Base-TX (RJ45) Auto-MDIX Ethernet port for the “http” communications (real-time measurements and memory logs) and “Modbus over IP”. It is equipped also with a serial RS485 port, protected against overvoltage, using Modbus-RTU, configurable up to 38.400 bps, which is slave for the RJ45 and Master for Net D6 versions allowing to connect other Electrex devices in a sub-network. The .. Wi-Fi o Wi-Fi EDA versions (with a connector for an external antenna) communicates using an existing Wi-Fi network without the need to be connected to an Ethernet cable while the presence of NFC opens the possibility for the creation of specific APPs for mobile devices on the energy management. The ..2DO or 4DO or 1RO or 2RO versions are equipped with outputs which can be related to the internal alarms. Each alarm can be linked to any one of the parameters available, for example, either as a minimum and/or as a maximum. All the alarm outputs can be linked to the same parameter in order to have more alarm thresholds. It is possible to set a delay on the activation / deactivation of each alarm (from 1s to 99 min), the hysteresis (% of the threshold value) and the polarity of the output contact (NA, NC, except for the 1RO which is always NC). The alarms state information is always available on serial communication as Modbus “coils”. Due to the numerous combinations available, only a part of them are programmable by keyboard while are entirely programmable via serial port with the Energy Brain software or via serial port using Modbus Holding registers. 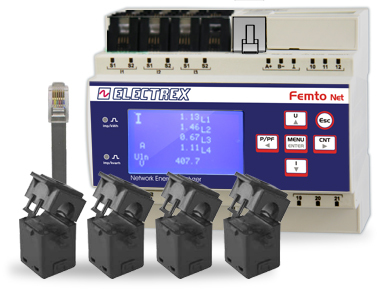 The Femto 4Hall D6 is equipped with partial time counters logging the operating time of a load or a machine. The counter can be triggered from the exceeding of a threshold related to a measurement or the status change of a digital input. The Femto 4Hall D6 can measure directly up to 300V. For higher voltages up to 900V it is necessary the use of a voltage divider with a 3/1 ratio (e.g. 900V in input correspond to 300V in output). The voltage divider size is 2 DIN Rail modules.